The mechanism to allow localities to license projects is among major causes of ineffective public investment, said Economist Pham Chi Lan. 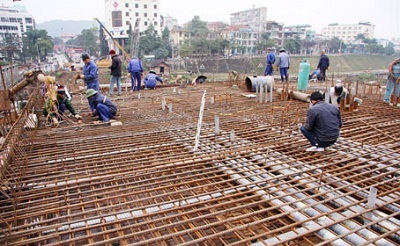 “In the last National Assembly session, many deputies agreed to deal with the massive public investment, however, during the discussion most of them wanted more projects to be implemented in their own localities,” she shared at a recent conference to improve public investment efficiency held by the Ministry of Planning and Investment, in Hanoi. Speaking at the conference, Trinh Huu Thang, director of Bac Giang Province’s Department of Planning and Investment, said that a commune of just 6-7 cadres was permitted to approve investment projects despite their limited capacity. “In some projects, communal officials simply follow the instructions of consultants even though it is usually in the interest of consultants to recommend larger projects, as this translates into bigger profits for them," he added. Over the past several years there has been a rush to build industrial parks, but to date only 46% them have been utilised. Many have no waste treatment systems and cause serious harm to the local environment. Up to 40% of Vietnamese public investment is poured into infrastructure projects, while the investment in agriculture, technology and education has been on the fall. Mr. Thang also pointed out loopholes in the bidding process, in which investors are allowed to approve projects’ technical design and contractors. This mechanism has created opportunities for investors to collude with contractors. According to Economist Pham Chi Lan, “Currently, up to 75% of projects are being implemented under the form of appointing contractors, not having them bid. Lan said that this is among the reasons for the inefficiency of public investment. She added that it is necessary to narrow the scale of public investment and ensure that contractors are competent. According to Economist Pham Chi Lan, the failure of public investment projects has the potential to cause numerous difficulties for the restructure of the banking system and State-owned enterprises because they are all closely interrelated. She suggested the construction of a legal framework that could improve the efficiency of public investment. Currently, the Law on Public Investment is still being reworked. Meanwhile, a number of related laws have been issued, weakening the means of management of public investment. Lan said that public opinion is almost never taken into consideration before projects are selected and implemented. "In fact, those projects that were done with the input of the public in mind have proven to be more successful," she said. The mechanism of oversight for public investment also needs to be strengthened, she emphasised.